Vicino a Disney PARCHI, vicino ai migliori ristoranti, vicino al supermercato, questo posto è davvero sorprendente per godere con la famiglia. È una casa molto confortevole, camere spaziose, vista lago, con una zona molto bella piscina. Chiedi per il riscaldamento della piscina è extra e facoltativo. Questa casa si trova a Sunset Lakes, è una comunità molto buona, così tranquillo e piacevole. Siete invitati a godere di questa bella casa, cucina completamente attrezzata, lavatrice e asciugatrice, e di sicuro si avrà momenti indimenticabili con la famiglia e gli amici. È un riproduttore per il mio per la cura la vostra vacanza e di portare il mio servizio personale ed eccellente in qualsiasi momento. Molto importante sapere: non fumare in casa e senza animali domestici. Piscina Riscaldamento è un costo aggiuntivo e servizi opzionali. Master camera da letto con bagno privato. Overall, we enjoyed our stay at this Sunset Lakes property. Very clean and comfortable, and would stay again. 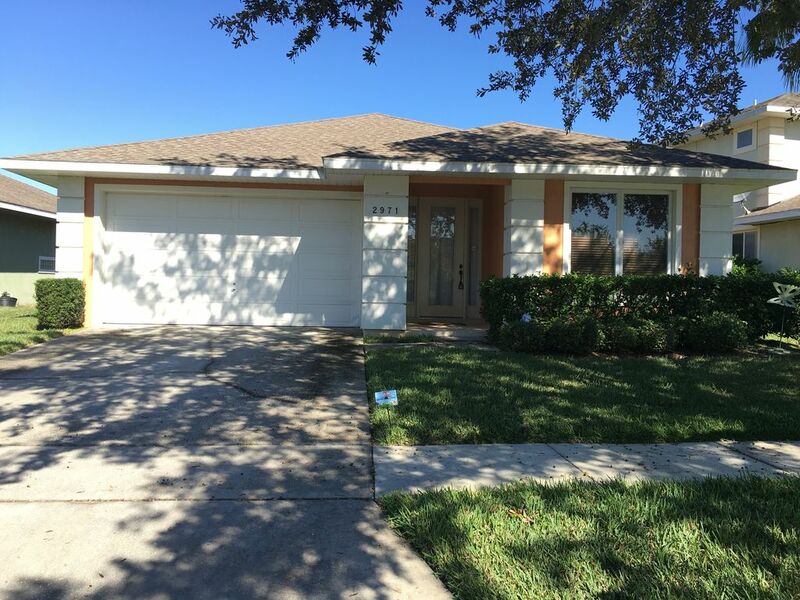 The property is about 15 minutes away from the Disney theme parks and 25-30 minutes to Universal; easy drive with plenty of restaurants, convenience stores, and other shopping close by and along the way to/from the parks. Perfect for a family of 5-7. We stayed for 23 days in October 2018. We have stayed at Sunset Lakes many times previously, but this was our first stay in this villa. The property was clean when we arrived & there was plenty of spare bedding, towels & pool towels. We had a few minor maintenance issues on arrival which were quickly dealt with once we contacted Maireddy. The villa is in a quiet location on a great gated community & has an excellent view over the main lake. The property is very close to an excellent range of restaurants & shops, & very close to Disney about 10 - 15 minutes, Universal about 30 minutes & Sea World about 20 minutes drive. Our security deposit was refunded quickly. The property has an unusual layout which may suit some but didn’t work for the 4 Adults in our party. The master bedroom has a door to connect it to the queen bedroom. Despite us using the window blind in the bathroom, every time we used the master bathroom in the night the bathroom light disturbed the occupants of the queen bedroom. There is no hanging space in the master bedroom as the walk in wardrobe has been locked by the owner, so we had to use a free standing clothes rack we found in the garage to hang our clothes, which made the bedroom feel cluttered and untidy. The bed in the master is also quite high & we had some difficulty climbing up into it at night. Our daughter & son in law found the queen bed uncomfortable, & eventually had to move to use one of the twin bedded rooms, due to this & the light disturbance from the master bathroom. The bedrooms got rather hot overnight. The leather on one of the sofas is starting to flake. The garage contains a lot of maintenance & decorating materials chemicals, paint, dust sheets etc which are not locked away. This could be a safety issue for children. There is no property handbook with instruction manuals, details of local attractions etc, There are also no management company details you have to contact Maireddy for everything. We found the lock box for the only front door key difficult & fiddly to use. The property has an alarm system but we were unable to use it as there were no instructions on how to set it. On balance while we still had a great holiday & will definitely go back to Sunset Lakes we would not book this villa again, which is a real shame as it has the potential to be fantastic. Had a great time the home was clean , equipped with essentials and spacious for my family , me , wife and two girls. I was skeptical since my 6 year old is in a wheelchair and i did not ask if it was accesible for her as we where willing to wing it but the place turned out to be PERFECT!! She got around easily and woke me up early every morning to go to the pool😁�! Truly a great home and the pool was clean.. only thing different I would do next time around is request for the pool heater to be on.. but we live and learn. Mairredy is great as she replies to your questions and messages very quickly. We will definitely be going back again and booking this home when we travel up to Orlando. Thank you Maireddy for your attentiveness. Thank you so much for visiting, and I happy to know yo had a great time. Property was very functional although a little dated. The setting in the lake is amazing. Minor issue with an incorrect access code provided. Although than that, very good. Everything it was so clean, the pool area it was so nice, we really enjoyed our stay!!! I really recommend this place to enjoy your vacation! I’ll be happy to help you again. upon arriving at the villa and just wanting to crash out after a long day travelling to find hairs in the beds not a good start. Upon stripping the beds then to find dirty/stained pillows and mattressess, even worse. This villa is not the best we've stayed in and im afraid to say it requires a bit of T.L.C. Sparsley furnished with only two sun loungers around the pool deck in a villa that sleeps eight....really. Leaking gutters leading to mil-dew staining around the pool area aswell. Also the floors in the bedrooms require a good clean as feet were left dirty after walking around bear-foot. Dont think we will be staying here again.... which is a shame because the location and setting are fantastic.